Bruno the scarecrow has a son, he's bigger, meaner, and he lives in our garage. Notes on life, Halloween, and a mostly insane, but usually beautiful world. Halloween goodness all year round! Amateur photographer S. Blue shares some historical moments. Mostly dogs. Some other stuff, but mostly dogs. Great if you like dogs. 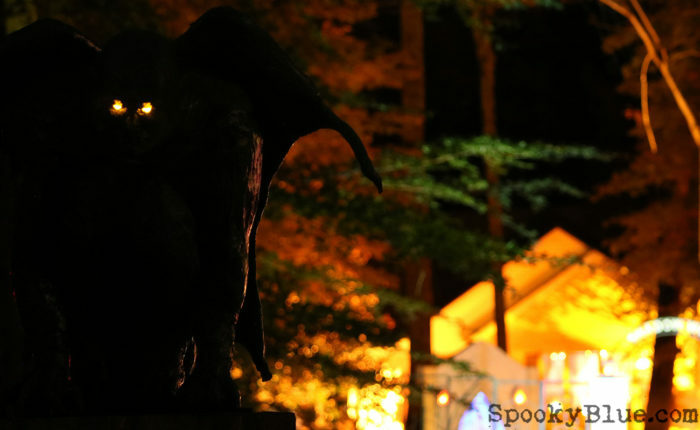 Create your own spooky specter out of scrap wood, a foam head, and a rotisserie motor. Survival tips you should read before the next outbreak of t-virus, rage, radioactive mutant plague, whatever. Police scanner frequencies and codes for southern Indiana. Yeeehaa! Stuff that just wouldn't fit on page 1 anymore. If you're looking for it, and it's here, you've found it. Lastest Snug Harbor pic that we liked enough to put on its own page. Sometimes a squirrel, sometimes a cloud. Sometimes updated. Have fun making sawdust, rewiring things, and just barely not burning off your fingerprints with a soldering iron. "Let dogs delight to bark, for God hath made them so"
If you're lucky, you'll know at least one crazy sheepdog over the course of your life. Gracie was our first. More than a how-to, less than informative. My wife keeps telling me I'm not funny.